Los Angeles native band (Fused By Defiance) formed in 2012 and signed to Wright Records/Sony Records in 2013, have created a unique sound combining roots ranging from Hip Hop, Metal, Funk, Reggae and Latin cultures. Fused By Defiance (FxD) composed of five members have dedicated their time and effort to assemble their first project. 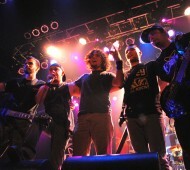 With original songs like “Their Only Purpose”, “Civil Disobedience”, “They Were Kings Once”, “Enthrone” and “Burn” this band displays their versatility, knowledge, experience and ability to innovate a new sound which gained them first place in the L.A. Battle of the Bands Vans Warped Tour 2013. Band member’s live performance experience range from venues such as: House Of Blues (Anaheim & Chicago), The Viper Room, The Key Club, The Roxy, The Whisky A Go Go, Chain Reaction, The Troubadour, El Rey Theatre,The Queen Mary, The All State Arena (Chicago) and Warped Tour 2013 (Ventura, Ca).